Simple vegan stir fried dry curry made from Onion stalks and brinjals. Ready in less than 30 minutes! Ever walked by a vegetable aisle wondering what "that" vegetable is and how one cooks it? Happened to me a few years ago when I saw a lot of vegetable carts on the road side stocking up on green stalks with a tiny white bulb at the end. Curiosity made me ask what it was. And I was introduced to the "Onion Stalk / Flower" or "Eerulli Kaavu"/"Eerulli Hoovu" as they call it in Bangalore. The green stalk is the onion plant with the flower at the end. 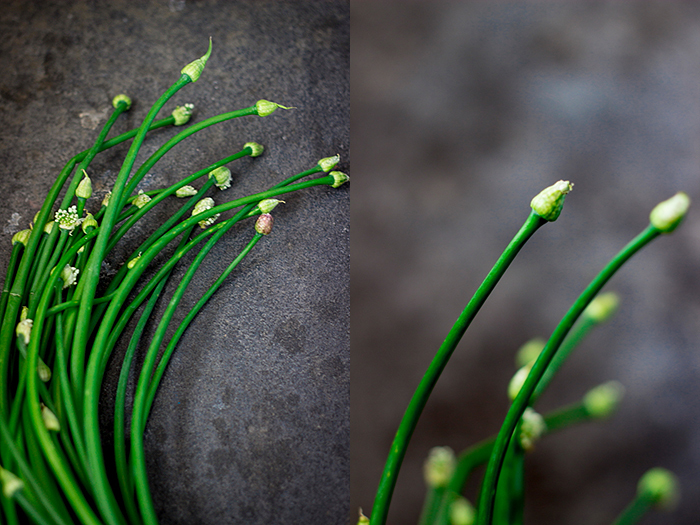 If you have never seen it or tasted it, the closest thing to it would be green onions or spring onion stalks. It is never sold with the onion bulb attached. While sometimes, it can be pungent like onions, most often it is simply sweet and crunchy. And the good news is, it is right now in season in Bangalore and you will see it stocked all over the local markets and supermarkets. I love cooking with seasonal vegetables. They taste so much better and are fresher than those annually available veggies. The first time I saw these onion stalks, I asked the vendor how one cooks it. He told me just stir fry it in oil and add spices. That's it! His recipe was so simple and it was tasty, if you like onions a lot. I do like onions, but I'm not a fan of a bowl full of them. So I went looking for different ways to cook it and I chanced upon this recipe by Chandrima . She added stir fried brinjals or eggplant to the fried onion stalks. Adding brinjal added some substance and texture to this dry curry. 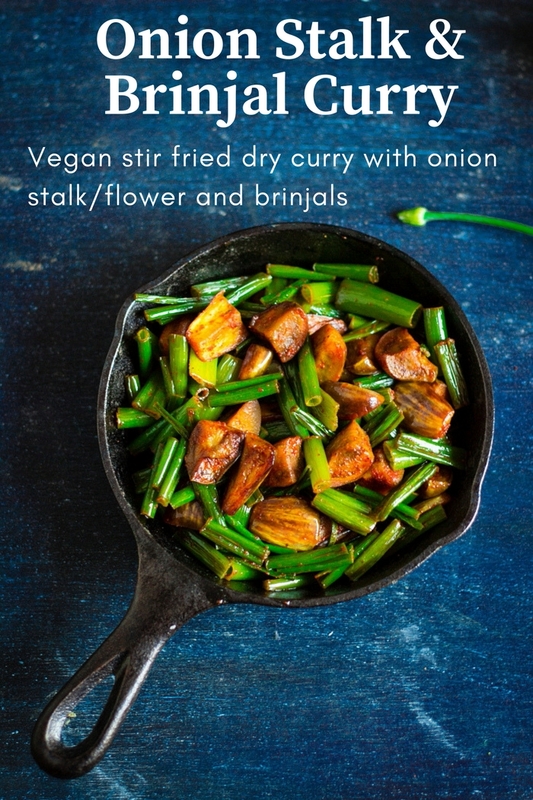 These onion stalks are versatile, I added them to "Thalipeeth" and it tasted really nice. I made this same curry with potatoes instead of brinjals and everyone loved that too. Vegan stir fried dry curry made of fresh onion stalks and brinjals. Chop the brinjal into chunks. Heat 2 tsp oil in a kadhai / pan. Add the brinjals and cook on low heat until done. Add in a little salt, turmeric powder and stir fry for 1 minute. Chop the onion stalks into 1" pieces. Heat the remaining oil in the kadhai and add the onion stalks. Add salt and turmeric powder. Mix well. Cover and cook until done. I left mine crunchy, cook longer for a softer texture. Add in the cooked brinjal and red chilli powder. Mix well and stir fry for 2-3 minutes. Serve hot with rice and dal or with rotis.